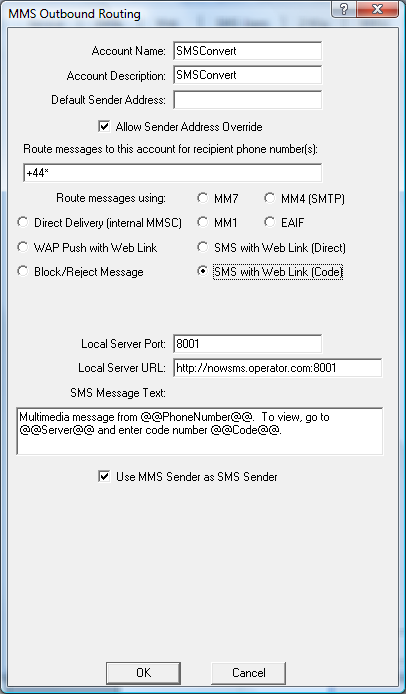 The “SMS with Web Link (Code)” routing defines that any MMS messages should be converted to an SMS message that includes a link to a web page where the recipient can go to retrieve the content of the MMS message. Multimedia message from +4477777777. To view, go to http://mms.domain.com:8080, and enter code number 1234. The recipient can then navigate to the web link using a WAP browser on a mobile phone, or a web browser on a PC. They will be prompted for their phone number and the code number that was supplied in the SMS message. After entering that information, the message content will be displayed in the browser. This route is frequently configured as a default route, which means that this route is used if a recipient was not in the “MMSC Users” list, and not covered by a recipient address mask in another “MMSC Routing” definition. “Local Server Port” specifies an available port number on the PC running NowSMS which will be used to accept connections from recipients who are attempting to connect in to retrieve MMS messages over the web interface. This port number must be different from other port numbers configured for use by NowSMS. This port must be unique, because the only functionality provided through this interface is MMS message retrieval over the web interface. Other NowSMS ports will likely have restricted access via a firewall, however this port needs to be open to the outside world to allow these types of messages to be retrieved. “Local Server URL” specifies the externally accessible URL that recipients will access to connect to the “Local Server Port” on the MMSC. This setting will default to the “Local Host Name or IP Address” configured for the MMSC, and the “Local Server Port”. However, if you are remapping the address and port via a firewall, you should specify the external host name (and port if required) in this field. Keep in mind that some users may be restricted from retrieving content from non-standard web server ports. @@PhoneNumber@@ will be replaced with the phone number of the message sender. @@Server@@ will be replaced with the value configured for “Local Server URL”. @@Code@@ will be replaced with a code number that the recipient must enter in order to retrieve the MMS message content. “Use MMS Sender as SMS Sender” – This option specifies that the SMS message that is sent out should use the sender address from the original MMS sender, if the original MMS sender was a phone number.